Oh no! Alien robot UFO helmets have become a threat and it’s up to a discarded Star Wars helmet to take the universe back!! Travel through the beautiful universe tilting to steer and letting your guns fire. Super Blast is super blasted to us from Phantoom Entertainment UG for $0.99 on the iPhone, iPod touch, and iPad. 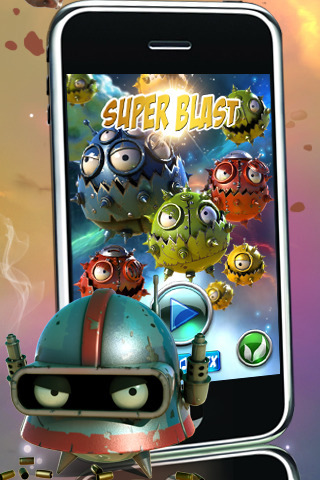 Super Blast is free fro a limited time. It really puts me in a good mood to see darn good 3D renders. It’s so rare in the iDevice App universe. Graphically, this is a gorgeous game with tons of beautiful lighting in the background and great looking character designs. These guys spent a lot of time on the textures and lighting and it really shows. Particle effects and explosions are bright and later in the stage, it becomes extremely frantic but pretty. The gameplay involves tilting your iDevice left and right to steer your helmet man. He fires all by himself so it’s just up to you to guide him in front of your enemies. If a single enemy passes you, you lose, so make sure you stay focused on killing, not dodging. You can collect the random powerups that usually upgrades your guns to double rapid fire or triple spread shot. Of course, my favorite powerup is the one that makes my life easier: the spread shot, but both powerups are extremely useful. The trick is that the powerups only last a certain amount of time and you basically are scrambling to get another one after your first one fades away. The game allows you to move to one side and appear in the other like a continuous wrap. This, I find, is an easy cheat. Just tilt your iDevice and let the guy run laps around the bottom of the screen blasting almost everything in your way. With any of the powerups, this becomes a no-participation game… until the big giant enemy comes your way. It can tank a ton of damage and you’ll actually have to focus your attack on it to kill it. The game would be more interactive and less cheap if they blocked off the edges though. I liked the one-handed controls, but I really wished they would give you the option for manual controls. Sometimes it’s just easier to drag your finger on the screen. There is a little bit of space under your helmet man that could be used for your finger to drag on to determine where your character will go. Maybe a left/right arrow system or a joystick interface option… anything will do to make the game more playable for all its customers. Overall though, the current control scheme is adequate. The game is beautiful, the gameplay perfectly solid, but I find that there is still something lacking in the game in general. Many times, shooter games like these are Flash tutorials. It teaches you how to set up most scripts that you would need for other games like projectile respawns, enemy spawning, movement, powerups, etc… It just feels like an extremely well done, very pretty beginner’s project. Hopefully, with more progress come more innovation and more impressive designs. At the moment though, I still enjoyed the art and basic gameplay. 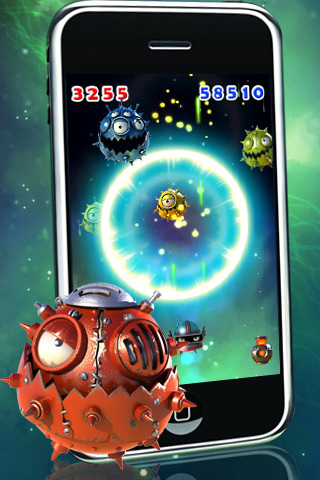 AppSafari review of Super Blast was written by Joseph Ho on October 25th, 2010 and categorized under Action, App Store, Games, Scrolling Shooter. Page viewed 3371 times, 1 so far today. Need help on using these apps? Please read the Help Page.